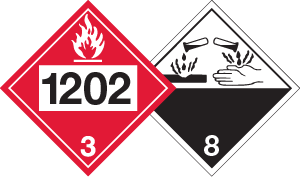 Defines Hazardous Material as those that pose an unreasonable risk to health, safety and property when transported in commerce Defines Hazardous Chemical as those that have any physical, health, simple asphyxiant, combustible dust, pyrophoric gas or other hazards Both clearly indicate what could be hurtful to people. It is possible for something to be both a hazardous material and hazardous chemical. Uses a system of marks, labels and placards on the outside of packages and vehicles during transport to convey hazards. Uses a system labels on the outside of the immediate container to convey hazards. Both have a clear system and could appear on certain packages. Click here for a poster (PDF). You have to understand each one to fully comprehend the information. Utilizes an Shipping Paper to convey information Utilizes a Safety Data Sheet to convey information Both have an information accessible on a single document. Additional Resources » Additional Resources » Both have easy to find additional help. Overall, these two are quite similar in their goal to keep people safe. It is in the details of each one that the true differences are discovered. Nothing drives this point home more than one of ICCs training courses. We offer transport for all modes and OSHA HazCom training. These are available via Online Training, live instructor-led webinars, live public settings, and on-site training. We can present you with a standard course or customize it to your site, products, and policies. ICC is also able to supply you with the placards, marks and labels used by both DOT and OSHA as shown in the video. We also have everything you need to be compliant with the Canadian regulations. It is safe to say this joint presentation wasn’t a bad joke or an oxymoron at all. Give us a call today to see how we can help.